just finished doing this; took me just over 2 hrs start to finish....that doesnt include the reading of this thread and others (probably another 3 hrs of that). really wasnt all that bad, and only cost $16 ($10 for the plugs and $6 for the amber bulbs). Has this been put in the Wiki? Is there ever going to be a WIKI on this mod? I am really considering doing it on my '06 but it gets confusing reading all these posts! I've read it several times, and yes I'm new at this, but I am confused! I just want something that lists everything in order and kind of walks me through it without jumping all over the place!! Haha So if anyone could maybe help me out? I just did this mod on my Bull. Looks great but I was wondering the opinion on this. Does the red bleed through look cool or is there some way to block the red light when the signal comes on. I'm sure with a lot of patience, I could get some reflective aluminum tape inside to block out some of that red. Any other comments, ideas, input? Here's a photo. It is easier to see in real life of course. the tape should work on keeping bleeding through. however i kind of like it with the little bit of red. Ha good deal. I was just wondering what opinions were of it. But if people like the two colors, may as well just leave it as is! If you look at the design of the 00-03 lamp, you will notice that that quadrant outlined in yellow and partially in red, was actually the reflector...whereas on the 04-07 it's overlayed a bit since I guess Ford thought a turn signal was going to be installed? So a reflector had to go somewhere. Wish they integrated the reflector into the bumper instead of the light, kind of takes away from the design of the light. I would just leave it alone. In my experience seeing it light up at night from more than about ten feet away from the car, you're barely able to see that there is a sliver of red lit up with the orange turn signal- the actual bulb is located directly inside the clear section of that lens. It's a minor annoyance, at most. 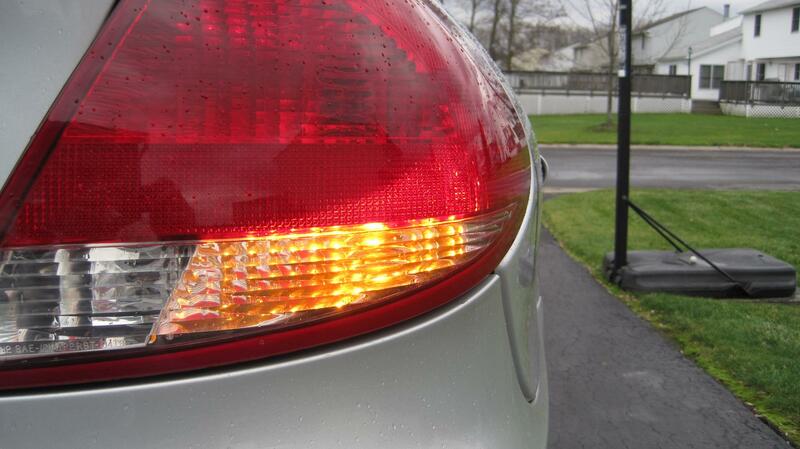 Fair enough, The amber turn signals with a little red FTW over factory turn signals!! Much better then all one bulb!